ANN ARBOR, Mich., December 12, 2012. 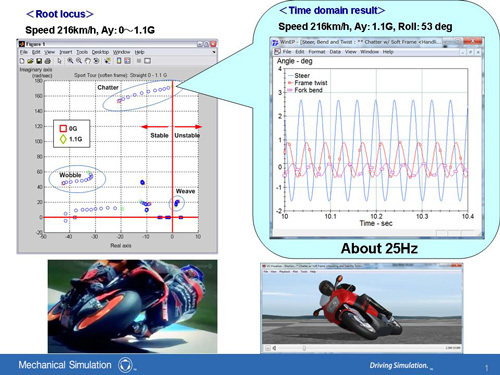 In testing a new version of Mechanical Simulation's BikeSim software for simulating the dynamic behavior of motorcycles and scooters, Dr. Yukio Watanabe (the chief developer of BikeSim) identified a feature of motorcycles that had been observed but not understood by MotoGP race teams. One of the major new features in the coming release of BikeSim 3.2 is the capability to "linearize" the vehicle math model to support classical analysis methods often used with simpler models. A common application for this feature is to identify vibration modes of the vehicle that can cause stability and safety problems. In testing the new feature, Dr. Yukio Watanabe confirmed that BikeSim correctly captured some well-known vibration modes called "weave" and "wobble." However, he also found a vibration mode that has not been described in the technical literature. In collaboration with Professor Robin Sharp - the well-known motorcycle researcher who first defined the weave and wobble vibration modes in the 1970s (and supervised Dr.
Watanabe's Ph.D. in the 1990s) - Dr. Watanabe investigated the BikeSim predictions and identified a vibration mode called "chatter" that affects MotoGP racing teams when operating at high-speed and high cornering loads (more than 50 degrees of lean, with lateral acceleration of about 1 G). Chatter is due to the combined vibrations of motions in steer axis rotation, fork/chassis twisting rotation and longitudinal fork bending. Further research with the new BikeSim linear analysis showed that all motorcycles have the potential for chatter vibration as well as weave and wobble motions. However, the chatter is usually stable and doesn't resonate under normal riding conditions; it mainly appears under race conditions when the chassis structure is not stiff enough.